You'll explore the less-touristy side of things at Frere Hall and Tooba Mosque. There's lots more to do: browse the different shops at Dolmen Mall Clifton, take an in-depth tour of Mohatta Palace Museum, have some family-friendly fun at VR Live Pak, and brush up on your military savvy at Pakistan Maritime Museum. To find ratings, photos, and other tourist information, you can read our Karachi tour planner. Use the Route module to find suitable travel options from your home destination to Karachi. In June, plan for daily highs up to 42°C, and evening lows to 34°C. Cap off your sightseeing on the 28th (Fri) early enough to travel to Lahore. Discover out-of-the-way places like Lahore Guided tours and Shahi Hammam. There's still lots to do: steep yourself in history at Badshahi Mosque, step into the grandiose world of Lahore Fort, see the interesting displays at Lahore Museum, and get outside with Bagh-e-Jinnah. For where to stay, photos, other places to visit, and tourist information, go to the Lahore road trip planning app . You can fly from Karachi to Lahore in 4.5 hours. Other options are to drive; or take a bus. In June, plan for daily highs up to 45°C, and evening lows to 31°C. Wrap up your sightseeing on the 2nd (Tue) early enough to travel to Islamabad. Step off the beaten path and head to Pakistan monument and Pakistan Railways Heritage Museum. Step out of Islamabad to go to Hassan Abdal and see Karakoram Highway, which is approximately 1h 10 min away. 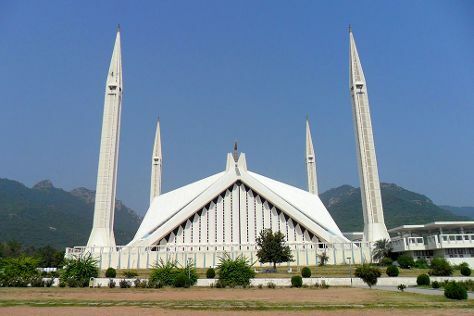 There's much more to do: contemplate in the serene atmosphere at Faisal Mosque, explore the striking landscape at Margalla Hills, take some stellar pictures from Daman-e-Koh, and examine the collection at Pakistan Monument Museum. For traveler tips, maps, and tourist information, use the Islamabad route tool . Getting from Lahore to Islamabad by flight takes about 1.5 hours. Other options: drive; or do a combination of train, bus, and taxi. In July, plan for daily highs up to 40°C, and evening lows to 29°C. Finish your sightseeing early on the 6th (Sat) so you can travel to Skardu. You'll discover tucked-away gems like Upper Kachura Lake and K2 Museum. When in Skardu, make a side trip to see Amburiq Mosque in Shigar, approximately 54 minutes away. Spend the 8th (Mon) exploring nature at Deosai National Park. There's still lots to do: take in the dramatic scenery at Manthokha Waterfall, don't miss a visit to Kharphocho Fort, explore the fascinating landscape at Katpana Desert (Cold Desert), and contemplate in the serene atmosphere at Manthal Buddha Rock. To see traveler tips, maps, and tourist information, read Skardu trip planning app . You can fly from Islamabad to Skardu in 1.5 hours. Cap off your sightseeing on the 9th (Tue) early enough to go by car to Hunza. You'll explore the less-touristy side of things at Attabad lake and Passu Glacier. Step out of Hunza to go to Ghulmet and see Rakaposhi View Point, which is approximately 58 minutes away. There's much more to do: explore the historical opulence of Baltit Fort, admire the verdant scenery at Hunza Valley, explore the activities along Hunza River, and take in the views from Hussaini Hanging Bridge. To see other places to visit, ratings, more things to do, and other tourist information, refer to the Hunza online route planner . Traveling by car from Skardu to Hunza takes 6.5 hours. Expect a daytime high around 35°C in July, and nighttime lows around 20°C. Finish up your sightseeing early on the 12th (Fri) so you can go by car to Gilgit. Gilgit is the capital city of the Gilgit-Baltistan region, an administrative territory of Pakistan. On the 13th (Sat), take in the spiritual surroundings of Kargah Buddha and then take a memorable drive along Karakoram Highway. To see maps, ratings, where to stay, and tourist information, use the Gilgit trip itinerary maker tool . Drive from Hunza to Gilgit in 2.5 hours. In July, daytime highs in Gilgit are 35°C, while nighttime lows are 20°C. Finish your sightseeing early on the 13th (Sat) to allow enough time to drive to Chitral. Chitral: Khowar for "field"), is the capital of the Chitral District, situated on the western bank of the Chitral River in Khyber Pakhtunkhwa, Pakistan. 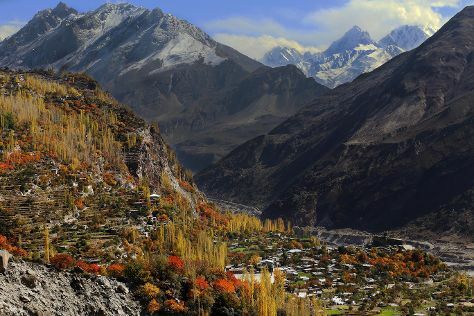 Explore hidden gems such as Chitral Valley and Chitral Gol National Park. And it doesn't end there: take in the awesome beauty at Tirich Mir, contemplate the long history of Chitral Fort, and appreciate the views at Tooshi Game Reserve. For traveler tips, other places to visit, maps, and more tourist information, refer to the Chitral attractions site . You can drive from Gilgit to Chitral in 7.5 hours. Expect somewhat warmer temperatures when traveling from Gilgit in July; daily highs in Chitral reach 41°C and lows reach 24°C. Wrap up your sightseeing on the 17th (Wed) to allow time to travel back home.